In the world of TENS Units, there are two ways to go: prescription and over-the-counter (Read more on the difference between prescription and over-the-counter electrotherapy devices). In general, and especially when buying over the internet, it’s much safer to go with over-the-counter units. (For more on this, see our previous blog post on prescription versus over-the-counter.) For a machine to be legally marketed as over-the-counter, it must be FDA cleared. This means that the FDA decides whether or not the device is easy and safe enough to use that anyone could successfully operate it without instruction from a professional. It is under this category that iReliev’s TENS + EMS Units fall. iReliev’s units come with several built-in safety features to ensure that users are getting the best from their experience. One prominent example is the auto-intensity reset safety feature. What is the Auto-Intensity Reset Feature? This-like all other precautionary features made by the designers at iReliev-is a preventative action. Its intention is to keep users from making a mistake during operation that could potentially harm them in any way. The auto-reset safety feature resets the intensity level on both channels to “0” if a) the device is not set up properly, or b) pads are removed from the body. In either case, if the intensity level were left higher than “0,” there would be risk of unintentional shock. If the machine is left on and a user is reapplying pads, they might experience an unexpected and unpleasant jolt. 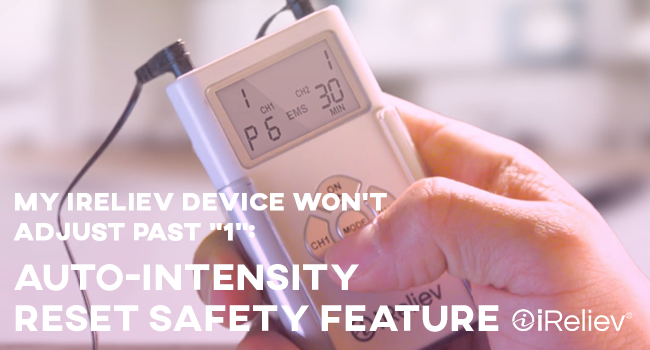 With the auto-intensity reset safety feature that is built into iReliev’s TENS + EMS Unit, there is no risk of this occurring. However, if users are unaware of this and other safety features, they might mistake it for a malfunction. On the contrary, these features exist to provide the highest possible functionality of the unit, and to give users the best results. If the auto-intensity reset safety feature on your TENS + EMS Unit has been giving you some trouble, this additional information will help you understand its purpose and how to use the machine properly so that it doesn’t reset when you’re not expecting it. When Do the Intensity Levels Reset? 3) if the electrode pads are not secured or set up properly. 3) All connected electrode pads (either two or four) are placed properly on body. The system can only function if conductive intensity is sensed.